Student protests against tuition fee rises are causing a "major draw" on police resources, Greater Manchester's chief constable has said. 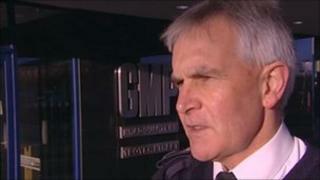 Peter Fahy said the protests meant some officers were "not chasing burglars". He said Greater Manchester Police (GMP)'s daily bill for policing such events was about £100,000. Mr Fahy said future campaigns by students would impact on local policing, even though the city did not experience violent scenes as in London. He said: "We have a clear duty to facilitate these peaceful protests, while ensuring minimum disruption to residents, businesses and shoppers. "Each day of protest has cost the force, and of course the public, around £100,000, but most of this has been paid for in normal duty time by taking officers away from their local policing duties. "This also requires substantial levels of policing and specialist resources from a host of other agencies and organisations. "This clearly has a knock-on effect for the rest of the force in terms of dealing with other incidents and regular policing of communities. "To put it bluntly, officers policing protests are not chasing burglars." Mr Fahy said GMP would continue to review its policing arrangements and co-operate with protest organisers to try to keep costs down. He said it was "unfortunate" that certain protests were infiltrated by outsiders. "These are national issues affecting many people and we fully understand the wishes of those wanting to voice their feelings," he added. "However, I want the people of Greater Manchester to be aware that there is an inevitable impact on the force and this shows again that modern policing is not purely about catching criminals."